Not often do you find a restaurant that serves gluten free pastries, but for breakfast I got to enjoy an egg white omelet, coffee, and a delicious almond cranberry muffin (picture above) that I could eat and enjoy!! Later that week we found ourselves back at Open City for dinner so I could try their gluten free pizza. It wasn’t my favorite g-free pizza, It was a little too heavy on the cheese and the crust lacked in taste compared to some gluten free crusts, but it was nice to have an option. 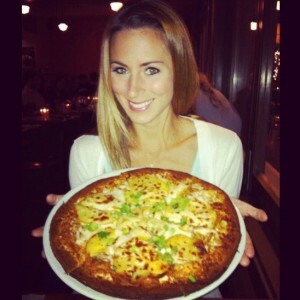 I can always go for pizza when I see it on a gluten free menu, it's such a treat! 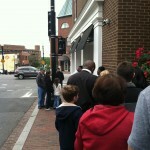 Another treat on the trip was stopping by Georgetown Cupcakes, known for it’s show on TLC called "DC Cupcakes". They had one gluten free cupcake as an option and I just HAD to try it. It was amazing. I do get nervous trying gluten free baked goods that are made in a cross contaminated baking space, but these were worth the chance of getting sick, which by the way, I didn’t get sick. Pretty much every restaurant I visited in DC the staff and chefs were great about making adjustments to my orders as needed to make my meals something I could eat making this trip a lot easier than it can be when traveling gluten free. It's definitely worth Googling like crazy and using social media as a tool to find gluten free options in the area that you're traveling in. Also, don't be afraid to speak up to your servers and educate them on your needs, it beats getting sick after a meal! 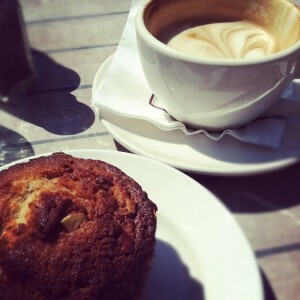 Please comment and share your favorite Gluten Free Spots in Washington DC! Hi Leanne! I hope that the next time you are in DC you will be able to enjoy one of the stops! Please let me know about any other fabulous spots you find in DC! Thanks for posting this! I like trying new places in D.C. I live about 30 minutes outside of DC in VA. Pizzeria Paradiso (vegan friendly too) also has great GF pizza if you are ever in DC again. (Also one in Old Town Alexandria and Georgetown). Another great GF (and vegan friendly) restaurant in D.C. is Busboys and Poets – Very high ratings! I went there and they were fantastic. I can go on and on about other great places around the area. 🙂 You’re so right though, takes research! Hope you had a wonderful trip. Cassi, I had heard about Pizzeria Paradiso while I was in DC and we just didn’t make it there. 🙁 Sounds like I missed out!! Thank you for the other great suggestions too, I hope to go back, I love the area and love how many gluten free options there are! Tenley where did you get the black lace dress you’re wearing in the first picture? I’ve been looking all over for one like that but haven’t had much luck! I love your site and all the gluten free advice/info, especially the recipes! I love your style too! Hi Madeline! I’m so glad that you found TIU! I was sick my whole life until I was 24 and finally found out what had been making me miserable all my life– so I’ve been Gluten free for 4 years. More of my story coming soon!